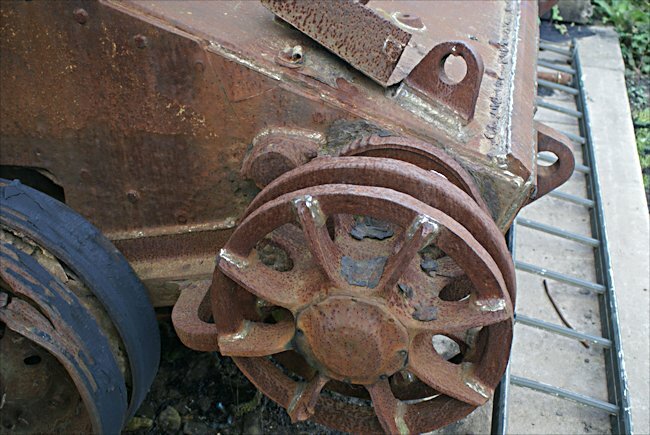 This is the chassis and turret of a WW2 British A30 Challenger Tank awaiting restoration. There are only two left. These photographs were taken at the Isle of Wight Military Museum. 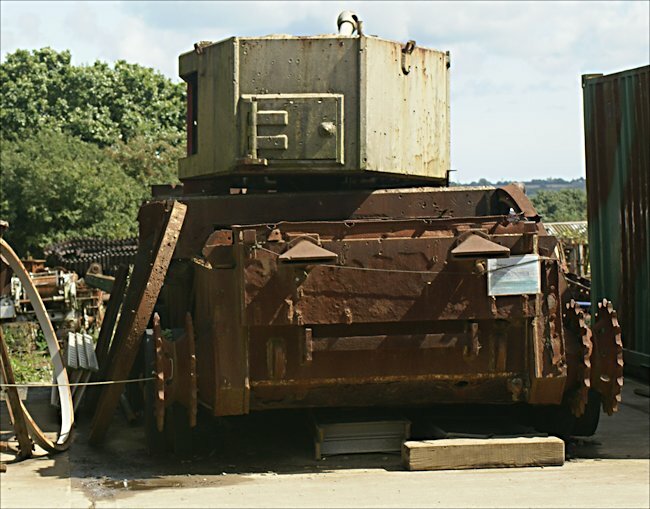 When the Museum closed in 2013 due to a dispute with the landlord the A30 Challenger was transferred to the Bovington Tank Museum. There is a fully restored A30 Challenger Tank in the Overloon War Museum in Holland, the Netherlands. 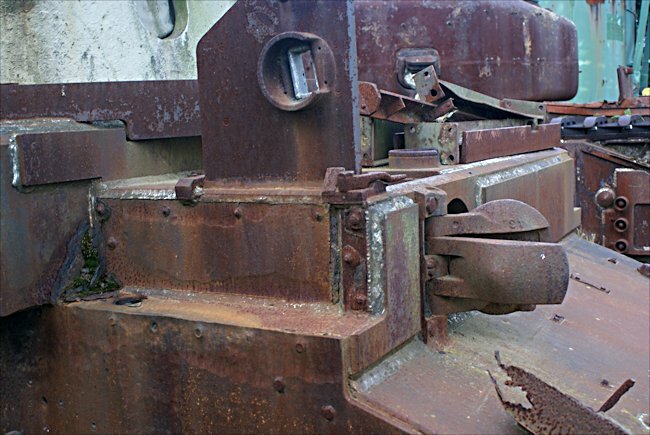 The turret and hull belong to two different machines, both of which were up-armored versions with the extra applique welded on. the engine bay is a mess, and the lower left rear 3 road-wheels and suspicion is ruined. the turret itself was used as a training tool and so has a large cutaway side and all fitting removed. The Challenger was an interim quick fix tank! The British Army senior ranks started to complain to Whitehall that the tanks, they had been given to fight the Germans in 1940 to 1941, were inadequate. The guns they had been fitted had difficulty penetrating German armour. The shells just bounced off their armour. The tank designers needed a quick answer whilst they were developing better tanks. In a War office report it was described as a "a temporary and rapid means of putting a 17pdr into Cromwell formations…It is not considered as a suitable mass production job; it is also too thin skinned"
The British 17 pounder gun had proven itself as a tank killer. 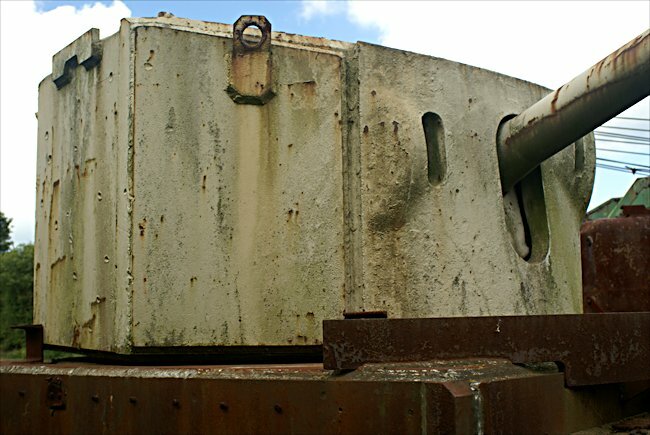 The problem was fitting this large weapon into the turret of existing tanks. The Cromwell tank was chosen as the first British armoured vehicle to be fitted with a 17 pounder gun. Rear view of the WW2 British A30 Challenger Tank and its massive turret. A new turret was designed. 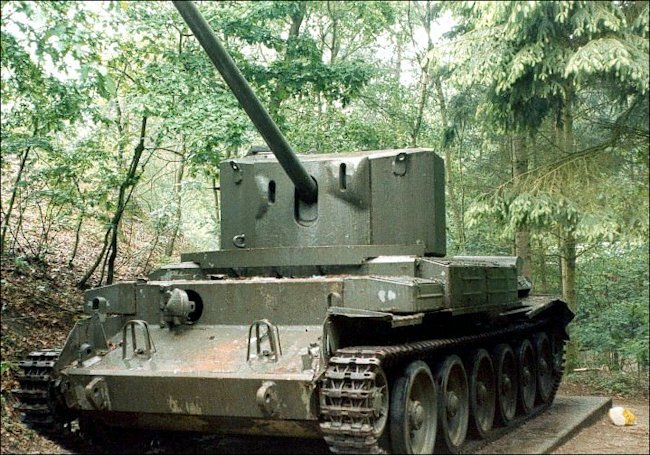 The problem was the whole was still too small so the extended the chassis of the Cromwell tank and made it a six wheeled tracked vehicle rather than the normal five. Only 200 Challenger tanks were made. They were able to keep up with the fast Cromwell tank. They supported them, when engaging heavily armoured German tanks like the Panther and Tiger tank. The A30 Challenger was more like a tank destroyer in that it had weaker armour than standard tanks like the Cromwell. This was to compensate for the additional weight the main gun. It was envisaged that it would engage the enemy at longer distances before their own guns came within range. It was not a vehicle to fight on its own. It needed the protection of other medium tanks. When sufficient amount of American Sherman tanks arrived, 17 pounder guns were added to new and improved turrets. The Sherman variations were known as Firefly Sherman tanks. They proved much easier to produce. After the initial 200 Challenger tanks were built no more were constructed. All efforts went into building more Firefly Sherman tanks. They did see action in northern Europe in 1944, supporting British armoured units. They were not able to wade ashore on the beaches of Normandy on D-Day. They arrived a few days later once the artificial Mulberry harbours were constructed. They were initially issued one tank per armoured troop. This was exactly the way as the Sherman Firefly was assigned to fighting units. The 15/19th King's Royal Hussars were part of the British 11th Armoured Division in Normandy. Their tank troops consisted of three Cromwell tanks and one Challenger. The A30 Challenger tank that is on display at the Liberty Park Oorlogsmuseum, Overloon, The Netherlands, carrys the same registration number (T 271940) of a Challenger tank used by the 15/19th King's Royal Hussars. The names of three of the five crew members are known: commander corporal S Potter, loader/radio Op. Trooper G Lyon from Liverpool and driver S Coombes from Cardiff. In October 1944, having fought it's way through Normandy and Belgium, the 11th Armoured Division was pushing froward into German-occupied Holland, with the 15/19th Hussars acting as the Division's reconnaissance regiment. Enemy resistance was fierce. On the 17th October a number of the Division's forward units were advancing from Deurne towards the German-occupied town of Venraij, west of the Maas canal in the province of Limberg. Between the Deurne and Venraij lay the village of Ijsselstein, also German held. It had to be taken and the task fell to 'B' Squadron of the Hussars and two companies of the 1st Battalion of the Hereford Regiment. The 6th Armoured Brigade had use of 6 for the first week of April only. In an official report the following was recorded (File Avia 11/30) "After a period of unpopularity, mainly due to trouble with front idlers, the Challenger is now generally popular. One or two instances of this tank withstanding an attack by Faustpatrones (Panzerfaust) without damage have given it a reputation for immunity which is probably not justified." The Challenger was also issued to the 2nd Battalion Welsh Guards and the 8th Hussars. All these units were armoured reconnaissance regiments for their respective divisions. British A30 Challenger Tank preserved at the Overloon War Museum, Holland. This tank is now displayed inside the main building. I like this photograph as it gives your an impression of how it looked on operational service in Normandy 1944. In November 1944 Polish Armoured units received Challenger tanks to support their tanks. They received enough of these long range 17pdr carrying tanks to equip one platoon in each squadron. The Polish 10th Mounted Rifles of the 3rd Brigade used them in Holland. The 1st Polish Armoured Division were issued with eight Challenger tanks during the first week of April 1945 which they kept right up to the end of the World War Two. Where can I find other preserved A30 Challenger Tanks?